How to live through a kitchen remodel without getting divorced. People always ask if Mark and I fight during our renovations…and we almost never do. We sometimes get a bit testy about halfway through any project, but we haven’t had any big blowups. I think it works for us because we always know that every project will take longer than planned and will likely cost a few more bucks than we allotted. Knowing this up front saves a lot of anger and frustration when we’re a month past our original “end” date and have thrown an extra $500 at the project. Since we live in the home as we renovate, we are meticulous about keeping a SUPER clean work space. I can thank my husband for this one. He is OCD about having his tools organized and put away and cleaning up the work space every single time. Even when we were in the heaviest demo phase…we always swept up the work space at the end of the day. It just helps with your sanity. When your house is a mess and looks junky…you feel awful. 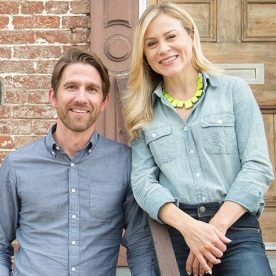 The last piece of advice we’d give to couples who renovate together is…drink some alcohol. ← We can’t just buy a light…that would be WAY too easy! Haha, love this!! My husband and I have done a few small renovation projects in our house, and I so agree that it always takes longer than you think and it usually more expensive. Knowing and remembering that always helps! My husband is meticulous about keeping everything clean, tidy, and in order. I am so thankful for that, too!